Isia wakes up with the sunshine these days. Her first question, as soon as her feet hit the floor, is "When can we go outside?" I usually stop for a moment and groggily try to visualize our day to give her an answer. Sometimes we need to wait until after errands (much to her chagrin) but usually we're able to go right away- after everyone's fed and dressed of course. As soon as she dashes out the back door, reluctantly stopping to put her shoes on along the way, she goes around the yard visiting her many projects. There's the fairy habitat we've been working on- I'll share more soon, promise- and the assorted holes she's been digging around the yard. And always an art project or two in the making. Sometimes it's a stone & sand pile, other times a collection of leaves. Lately it's been this mound of wonderfulness. Isn't it lovely? There's a system to it, and Isia would tell you all about it. She'd let you know that the mulch needs to go down first, then the rocks, and then the leaves. She'd then point out her favorite stones or leaves that she's "saving for Daddy." 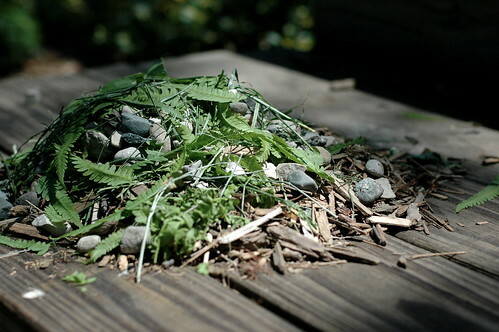 Since we love nature and art, we've studied a lot of Andy Goldsworthy. He's one of my favorite artists, and the inspiration behind several of our projects. 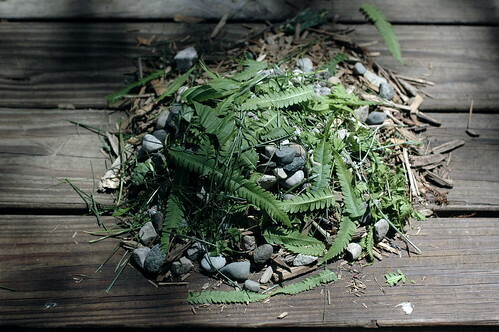 So it's not surprising to me that she makes these Andy Goldsworthy-like sculpture, even though I don't think she set out to consciously emulate him. Did she choose to make it circular since so many of his sculptures are? 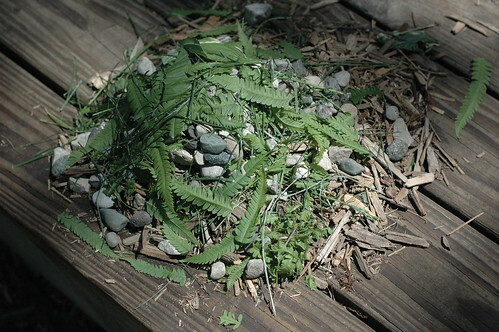 Or to create a gradation of materials- mulch, stones, leaves- like he often does? While I think she'd recognize similarities between his work and her work if they were side by side, at three and a half I don't think she's analyzing her process as she goes. I think she's just enjoying the materials and the sunny day. It's my joy to pick up hints of the process along the way, and tuck them away to share with her later. And to realize, again, why we should keep exposing kids to art. Because art becomes a part of us. Informing our perspective and creative processes in ways we may never truly understand- even if we're just a little girl playing in the backyard with sticks and leaves. Looking for more creative ideas for the whole family? for more fun & easy creative ideas! You know, it really is beautiful. I think partially due to the simplicity of it and letting mother nature shine. Have a lovely weekend! 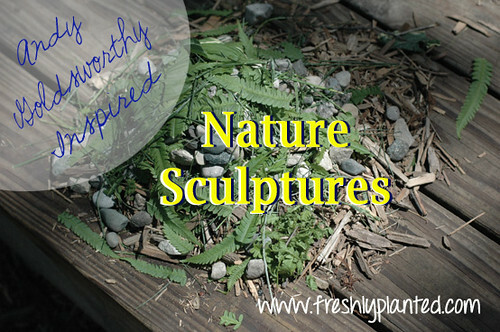 Simple and fun and a great way to introduce kids to art and bring them closer to nature. Lovely. Thanks for sharing on Kids Get Arty!